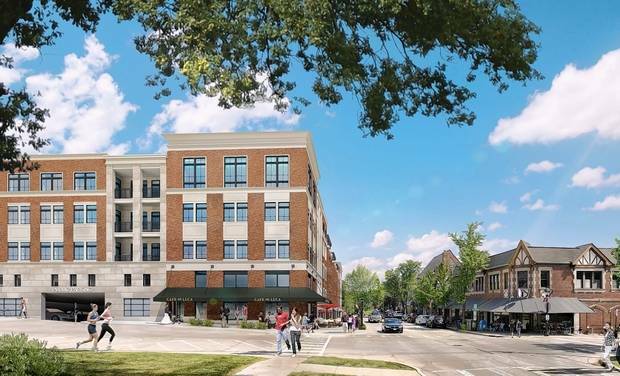 "The issues of height, architectural style and traffic remain at the forefront of a debate about the redevelopment of the former Giesche Shoe store at the northwest corner of Main and Hillside. Village trustees on Tuesday will discuss the developers' request for financial incentives and nearly a dozen conditions recommended by plan commissioners, who unanimously endorsed the plans. For proponents, the project represents a..."
Maybe if they photoshopped in a GEM driving her Q7 frantically down Main, it might help people better identify with the project. He may well be, but he is correct about the parking. I'd even go so far as forgoing the retail in this project. Save it for the McChesney & Miller spot that will never be done. I should expound. He is ******* for giving up public property with no thought of compensation. Fortunately, the village president set the record straight. but he is correct about the parking. These are both bad thoughts. So you are arguing for giving away a plot of land worth a reported $1.8MM in return for nothing except luxury apartment rentals with no street level retail? Can you give us a quick and dirty ROI calculation for us as taxpayers why that makes sense? And that's without even getting into the height issues. Does that mean vertically challenged dudes are brimming with charm? Asking for a friend. For a market value comp I used the "Wheaton 121" luxury apartment complex that has 306 units. It is assessed at about $26.8MM. That's about $87.7K per unit. (Remember that's supposed to be 1/3 of fair market value, and that sounds about right). Apex will have 107 units. So that puts it's assessed value at about $9.39MM. The current tax rate for the Village portion ONLY for the Giesche building is 0.8695 %. So that would project to a yearly tax haul for the Village of $81,655. Currently, they rake in $2,686 a year from Giesche's parcel and $0 from the other three parcels because they're Village-owned. That's a delta of $78.9K a year. And so that's like a 27 year pay back. And that's assigning zero value to the lost parking spots. What am I missing, Clamato? I'd even go so far as forgoing the retail in this project. I really don't know the relative value of retail space vs residential. Would the developer be better off cutting back apartments or the retail space from an income perspective? I assume the village would earn more from property tax and sales tax with retail vs property tax alone on residential? Agree with middle again. This is our downtown CBD. Any building in that location should have street level retail. Housing can be built anywhere. There really is no benefit to the village or residents, other than having a derelict building removed and a more "complete-looking" downtown. New residents require more infrastructure and services, and it was proven long ago that new housing development rarely works out to favor current residents or village finances--especially if it is subsidized with TIF funds or a land give away. The new taxes are likely a wash, or a very marginal benefit at best, and the village is giving something away. If this project doesn't benefit our community beyond lining the pockets of a developer, there is little reason to support it. The village could condemn the Geische building, and expand the parking lot--or put some green space there--as a "land bank" place holder until conditions favor a better development in the area. Don't get me wrong, I'd love to see that part of the downtown developed. I just find this proposal extremely... meh. Ugly design, too much bulk on Main Street, and why again do we need "luxury apartments" in this area? Today's "luxury apartments" are tomorrow's run down apartments. The life cycle is maybe 20 years. Last edited by Glenly Ellynby; 01-24-2019 at 02:44 PM. Since Clam won't answer my questions quick enough, I've had to devote more of my own brain cells to figuring out why the Village Board would want to do this. I suppose that what the Village is really after here is the TIF funds. Right now, per the parcel info site that I linked to above, the Giesche property is contributing 11 cents a year into the TIF fund (no joke - 11 cents- look it up). As I understand it, the way a TIF works is that any increase in property taxes from within the TIF district are re-routed to the TIF fund. So in my back of the envelope calc, that would mean that the Village will see not just the $78.9K increase per year. They would wind up getting about $718K a year, most of which would be in the TIF. The losers being D41/D87, the Library, and Park District, etc in that they would have gotten that cash but for the TIF. The Village can then spend the TIF money on TIF district improvements. So it starts to look a bit more appealing - money wise. It's still too tall, though. The TIF funds are paid by village residents (through foregone tax revenue) to the developer. It is a handout. Property taxes on the development parcel are frozen at pre-development levels to incentivize the development for the period of the TIF. The development raises the value of the property, but the taxes don't go up until the TIF expires. TIF's were originally invented to spur development in "blighted areas". This is not a blighted area, other than angry residents trying to thwart development. I don't think that's quite right, at least not entirely. That's not how its described in this Daily Herald article. Officials say funds generated from the TIF district, estimated to be between $16.5 million and $34.5 million over its 23-year lifetime, could provide a funding source for proposed infrastructure upgrades proposed in the downtown plan, and help incentivize private developers to build them. Without the district, supporters argue, reinvestment would only occur on a small scale. Under the TIF process, base equalized assessed values are frozen at current levels for taxing districts, and tax revenue derived from incremental EAV becomes available for economic development projects. • Public and wayfinding signage, streetscape improvements and a greenway. • A combined $15 million parking deck and retail development, potentially at Forest and Pennsylvania avenues. • A new $15 million train station and pedestrian underpass. • Facilitate a private, $12.9 million residential and retail mixed use development with parking decks on Main Street between Duane and Hillside Avenue. • Facilitate a private, $25 million residential development on St. Petronille church property on Hillside. Officials said the church "seems open" to negotiations for use of the lot. So I think the Village could use TIF funds to piggyback on a developer's project (sreetscaping funds or whatever) but it just isn't all handed back to a private developer. And they can use it for their own spending if they want (parking garage on Village owned land). The developer is set to get $800,000 of these TIF funds, if this proposal passes as currently constructed. The village gets the balance, if there is one. Anyone know how much that is projected to be? It’s the sum of all of the tax increases within the district for 23 years, minus $800,000. It’s not free money. It’s taxpayer funds diverted from property taxes. All times are GMT -6. The time now is 07:30 PM.